Lyn Mackay’s prequel to the successful Swansea Girls depicts ordinary people living through terrible times. The title captures its creator’s raison d’etre and it is clear each note of music and every word of the script is straight from the heart. The effects of the war on Coventry and East London are well documented. 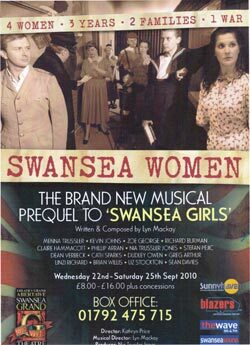 However, many other less significant cities suffered terrible destruction and this musical is a fitting tribute to the Swansea people who lived through those times. Kathryn Rice’s tight direction gelled a large cast together, still allowing each character their chance to shine. The huge cast reflected the sense of community in wartime and their expression of solidarity drew in the audience. Tunes were extremely catchy, proven by the lady next to me who hummed along throughout (which I really wish she hadn’t, as she sang all the notes, but not necessarily in the right order! Sorry Eric!) Thankfully the cast’s singing was faultless. From toe-tapping big band numbers to touching ballads, Lyn Mackay expertly steered the audience’s emotions from the heights to the depths. Jack Roberts and Danica Swinton’s harmonisation made “Down the Docks” a charming little number. Andrew Holton’s authentic set provided the perfect background and was particularly effective as the male cast visited every pub in Mumbles. “The Mumbles Mile” cheered everyone up after Cath Fraser-Sparks broke hearts with “When the Boys Come Home.” Her deep, rich voice expressed the sentiments beautifully. As war-torn young lovers Alfie and Lizzie, Zoe George and Stefan Pejic worked together with great simpatico. “You’ll be Mine” was a real ear-worm, still replaying in my head and Stefan Pejic delivered it superbly. Dudley Owen gave a sparkling performance as Ivor Thomas. His scenes with Menna Trussler as Elsie Morgan showed how these seasoned professionals were able to bounce off each other. Their duet “Bring Back the Old Romancing” was a real treat. The role of mother of the Davies family was delivered with great sincerity by Claire Hammacott. The music showed off her impressive singing range and her duet with Nia Trussler-Jones expressed their story powerfully. Nia Trussler-Jones gave a finely drawn depiction of a mother’s struggle despite all the odds. In her solo “All Cried Out” her moments of absolute stillness, looking out to the audience sent shivers down every spine. “Someone Else’s Son” was a touching piece, conveyed with great compassion by Kevin Johns. Richard Burman and Phillip Arran tackled difficult, unsavoury characters with skill, bringing in an element of sympathy. Adding to the essential unity of the piece were great characterisations from Dean Verbeck, Linzi Richards, Greg Arthur, Liz Stockton, Sean Davies, Brian Willis, Rachel Clee and Thomas Crowther. The final number brought the audience to its feet. “Swansea Anthem” was a fitting conclusion to a production that called up a feeling of belonging, of pride and an indefinable sense of “hiraeth”. I have never felt more proud to be a Swansea woman.